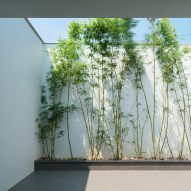 Plants grow up through the central atrium of this five-metre-wide house in Vietnam, designed by Nguyen Khac Phuoc Architects to offer its residents respite from noise and smog. A House in Trees occupies a narrow five-metre-wide plot in Tu Son town in Bac Ninh, a province east of Vietnam's capital that is facing rapid urbanisation. It provides a home for a couple and their two teenage children. The challenge facing Hanoi-based Nguyen Khac Phuoc Architects was the high levels of noise and smog in the area. To combat this, the architects created two large voids at the centre of the property. These act as a buffer to the pollution and also allow the residents to enjoy outdoor space. One of these atriums is located at the entrance of the residence, just behind the main facade, so is shaded from strong direct sunlight. "The void creates a padding to avoid the smog," the architects explained. "Shapes are created to avoid direct natural light." The wall behind features large glazed openings that lead to balconies overlooking the outdoor space, where a staircase leads to the main entrance. The second atrium is located towards the centre of the floor plan. Rooms are arranged around it, while a lobby and a staircase with a white metal banister run alongside it. There is no roof over the atrium, and the surrounding rooms all feature windows facing down into it. 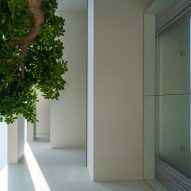 Some of these windows slide open, allowing the residents to access gravel-covered ledges planted with trees on each level, which they can use for sunbathing or reading. "At any space inside the house, the owner still could get in touch with nature directly," they said. "People may feel that they walk on the top of trees when moving in the space." 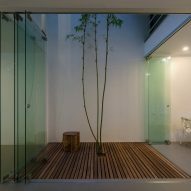 One the ground floor, bi-folding glass doors open the living space up to the decked patio, creating one large open-plan space for the kitchen, lounge and dining area. 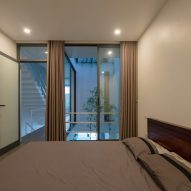 On the first floor, one of the three bedrooms also features sliding glass doors that open to the void. The house also features an entertainment room, a worship space and laundry room. 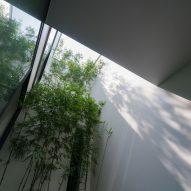 A House in Trees is the latest example of the trend for narrow houses, particularly in densely populated Southeast Asian cities, with planted courtyards at their centre. 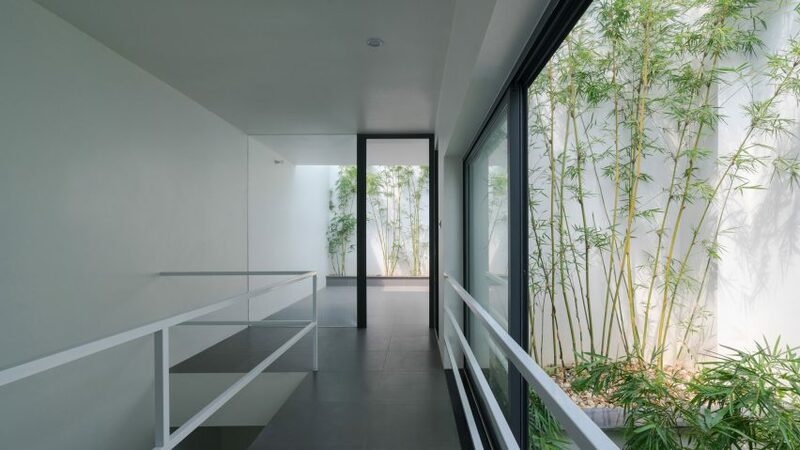 Nguyen Khac Phuoc Architects also used a three-storey-high atrium to bring natural light and ventilation into the heart of a four-metre-wide townhouse in Vietnam. 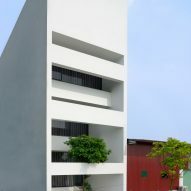 Other recent examples of skinny houses in Vietnam include a 3.5-metre-wide property by Kientruc O and a three-metre-wide family home by a21 Studio.